Does the world really need another banana bread recipe? As long as there are bananas looking to be reincarnated, I think it’s safe to say, we’re in business. If you fancy a change from complicated layered cakes, the welcoming calm of a simple loaf that exudes nostalgia, is what’s needed. 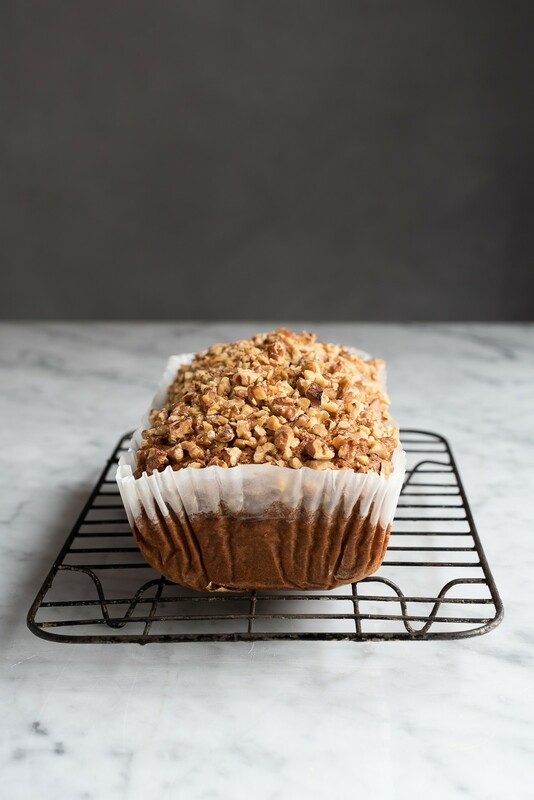 Considering the growing collection of banana bread recipes on the blog, my weakness for this classic bake is rather evident. Some are made healthy with wholesome ingredient swaps and others, a little OTT, like this chocolate fudge loaf with peanut butter frosting. Today’s recipe fits comfortably in the middle. 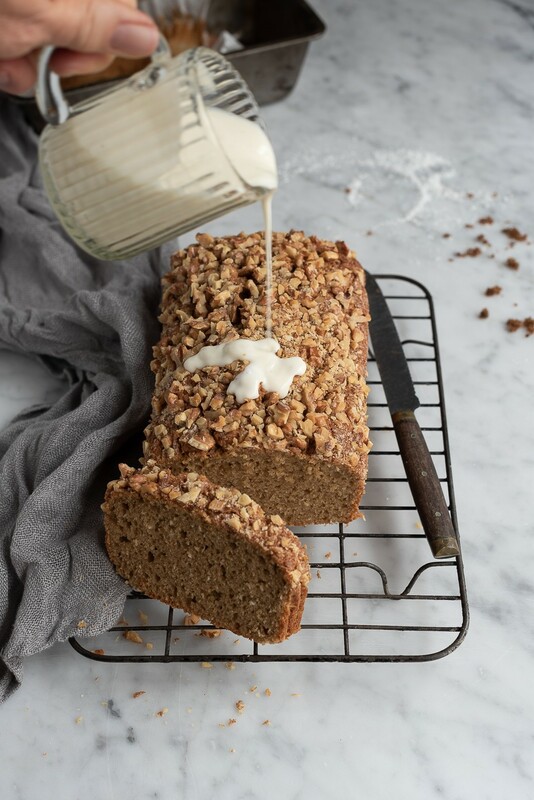 The addition of wholewheat flour and coconut lends a sort of nutty, tropical flavour. To encourage the caramel-ness that I was after, I used Natura Sugars Dark Muscovado Sugar. 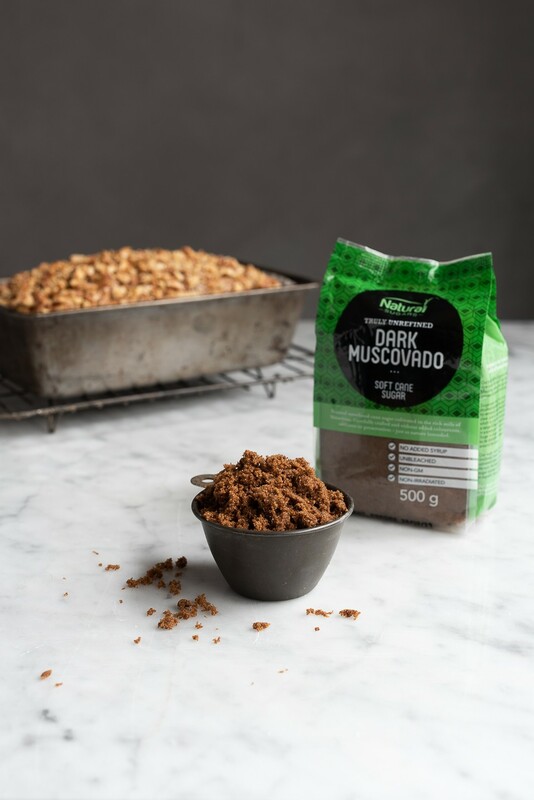 As the name suggests, it’s really dark with a rich molasses taste that gives the loaf its honey-golden glow. With the first banana bread test bake, I made a plainer version. No toppings and no drizzle. It was good, but not amazing. The second loaf was heavily streusel-ed. Also good, but not the best. Third time lucky. 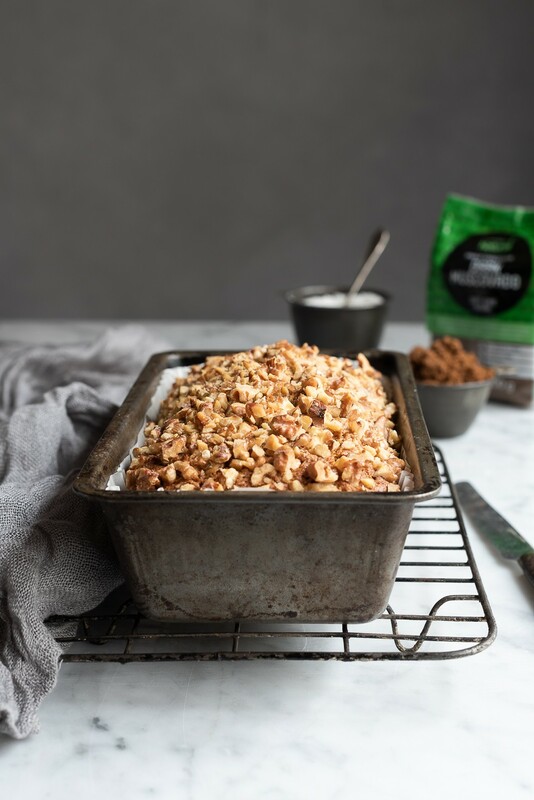 A sprinkling of cinnamon sugar and a handful of walnuts was the perfect fit. And just because a drizzle makes everything a little more special, there’s an easy 2 ingredient Yoghurt cream, if you feel so inclined. If your processor can accommodate the entire mixture, add the sifted ingredients and the coconut to the banana mixture and blitz together. 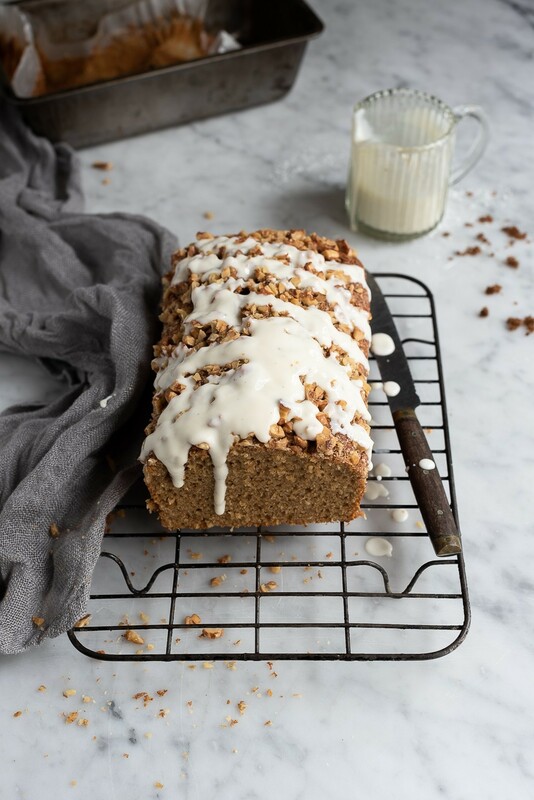 The texture of this banana bread holds together well, which makes ideal for toasting. For a spoiling weekend breakfast, we top warm toasted slices with Greek yoghurt, sliced banana and a drizzle of honey. 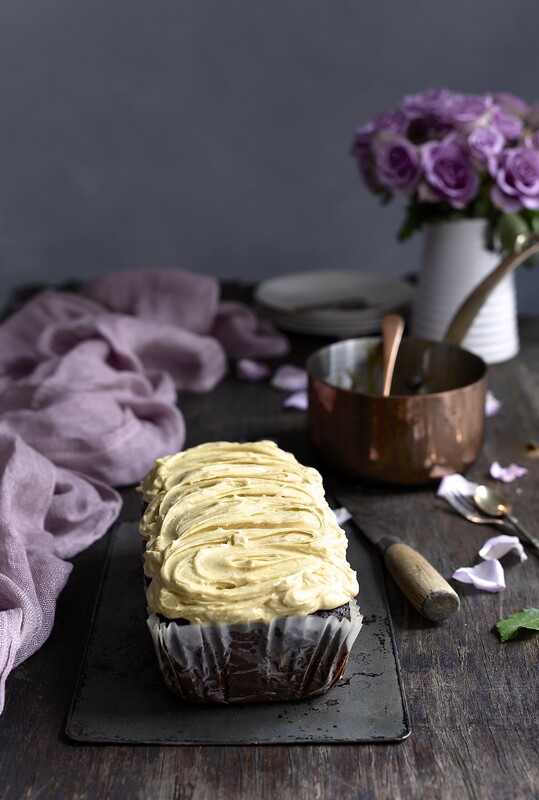 We’d love to know favourite banana bread recipe. Share your secrets with us in the comment section below and we might make it and share it here on the blog! Preheat the oven to 180º C. Line a 22 x 10 cm loaf tin with baking paper. Place the butter, coconut oil, Natura Sugars Muscovado Sugar, eggs, vanilla and bananas in a blender. Pulse to combine. The mixture should be smooth and the sugar, incorporated. Sift the cake wheat flour, wholewheat flour, baking powder and salt together in a bowl. Add the coconut to the flour and mix in. Add the banana mixture to the dry ingredients and fold through. Transfer the batter to the tin and smooth over. Sprinkle with cinnamon sugar and scatter the walnuts on top. Bake for 50 minutes. Check for doneness before removing from the oven. Cool on a wire rack before unmoulding. For the drizzle, whisk together the yoghurt and honey. Pour over the cooled loaf just before serving. Perfect timing, Di! I was just giving the last banana a depairing look …. you know the one that will just sit in the fruit bowl because its slightly over-ripe? We always have a bowl of sad bananas, which happens when you buy 3kg all at once! 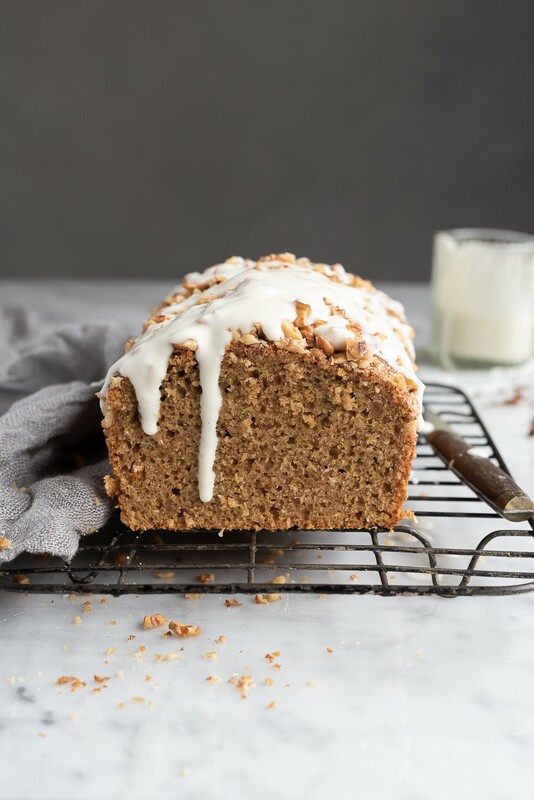 Secretly, it’s our excuse to bake more banana breads. Oh my oh my. This looks absolutely lovely. Plus I have some ‘sorry looking’ bananas at home. Hopefully this recipe arrived just in time to save them!